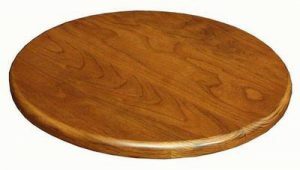 A Lazy Susan is a rotating tray that’s used on a table or counter to share food. 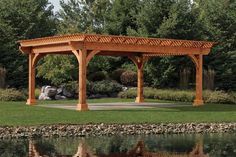 It can be made of wood, glass or plastic, and it is normally round. American Made Tabletop Lazy Susan. The Lazy Susan descends from the dumbwaiter and the original inventor is hard to determine. The path to the creation of the Lazy Susan is unclear, and its origin is considered a mystery. Historians have traced the Lazy Susan back to 18th century England. At that time it was referred to as a dumbwaiter (this was before the term dumbwaiter was used to describe little elevators in estate homes that transported food from floor to floor). Both the Lazy Susan and dumbwaiter were used in Europe and America. Their purpose was to assist in serving during meals and contributed to the replacement of servants. Lazy Susans are sometimes referred to as dumbwaiters since they shared a similar purpose. The Lazy Susan is thought to be a spinoff of the dumbwaiter. 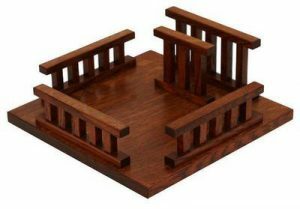 The Amish Arts & Crafts X-Base Dining Table with Optional Lazy Susan. Frequently referenced in the search for Susan’s identity is a 1917 Vanity Ad Fair that is credited as first mentioning the term Lazy Susan. 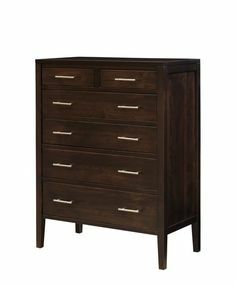 The ad was for a Lazy Susan made of mahogany selling for $8.50 at Ovington’s Department Store. Amish End Grain Checked Large Lazy Susan. 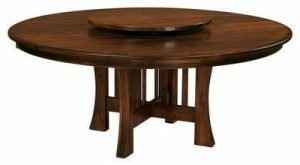 Lazy Susan Myths: Or Are They? Some say Thomas Jefferson invented the Lazy Susan. The tale goes that he invented it because his daughter complained that she was always served last at dinner. Others claim Thomas Edison, having invented a turntable for his phonograph in 1877, further developed it into the Lazy Susan. There’s an idea that Susan was a common name for maids and the term Lazy Susan was a criticism of household servants who were not working hard. Amish Lazy Susan with Rails and Spindles. Interest in the Lazy Susan began to wane by 1918. The term was added to Webster’s Dictionary in 1933. It re-emerged and became popular in the 1950s and 1960s when kitchens were supplied with convenient, everyday use solutions. 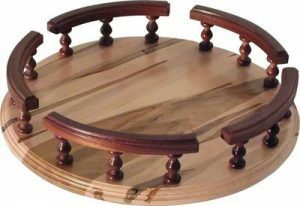 Amish Hardwood Square Mission Lazy Susan. 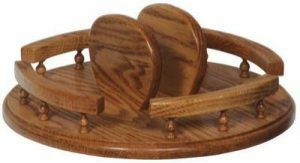 Oak Tabletop Lazy Susan with Napkin Holder. No longer considered kitschy, the Lazy Susan has become a multi-purpose tool for places inside and outside of the kitchen.